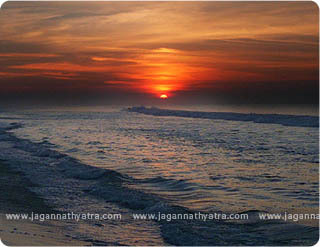 The Long stretch of Beach at Puri, known as Mohodadhi is one of the largest and loveliest in india. Most of the foreigners like this Beach and Indian corporate people, recommended this beach as one of the best resorts in India.Sea beach at Puri has it's own golden sandy look and beauties of nature. Like other Sea Beach of the world Puri Sea beach attracts lot of foreign visitors to spend some hours. Waves of Puri Beach, is not high like Indian Ocean, so people are enjoying long time for bathing. Now a days people are busy with their current schedule of work, they get very little time to enjoy the actual beauty of the nature. Perhaps they don't know, Life is very short span of time, they should visit the place which gives them peace and serenity. Sunset is beautiful, lots of poem has written to describe it's beauties. The Sunset, nature indicates to the world, it is the beginning of the rest time. Sunset at Puri, create lots of scenery for enhance the nature creativity. Originally Puri is the city of joy; literally it is called as 'Bhogakhetra' means land of enjoyment. Beach at Puri, satisfy the concept of Bhogahetra', More People prefer to visit beach at Sunset time, the color of sea are naturally change at sunset. People are enjoying, to count the tide of Sea. Balighai Beach, about 8 km away from Puri, is relatively quiter, and if you are lucky you may even spot the residential deer browsing through the undergrowth near the beach. For centuries now, the beach at Puri has been the venue of countless pilgrims taking the traditional purifying dip. However, for decades now, both Indian and foreign beach lovers have made it their special haunt. The fine golden sands of Puri beach and the roar of the breakers rolling in from the Bay of Bengal have fascinated visitors throughout the ages. As it is with all the beaches of Odisha, overcrowding is never a problem and the sight of holiday-makers having entire stretch of the beach to them selves is not uncommon. The local fishermen, with their catamarans and wide brimmed cane hats are welcomed by tourists.They are not only providing you with a ride on their boats but also act as lifeguards if you wish. And yes,they are also expert masseurs. With excellent beach facing hotels and guest houses, the Puri beach is an ideal holiday spot where you can easily spend a lot of time and relax.